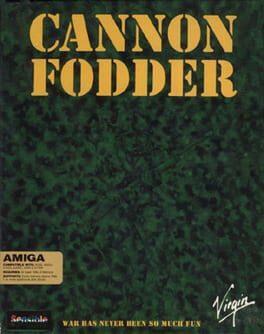 Cannon Fodder is an action-strategy shoot 'em up game developed by Sensible Software and published by Virgin Interactive. The game is military-themed and based on shooting action but with a strategy game-style control system. The player directs troops through numerous missions, battling enemy infantry, vehicles and installations. Cannon Fodder has a darkly humorous tone which commentators variously praised and condemned. Its creators intended it to convey an anti-war message, which some reviewers recognised, but the Daily Star and a number of public figures derided the game. In other respects, reviewers highly praised the game, which widely achieved scores of over 90% in Amiga magazines. Amiga Action awarded it an unprecedented score, calling it the best game of the year. Cannon Fodder is available from 5.69 to 5.69 from 1 shops.